"A CUSTARD-COLOURED SUPER-DREAM OF ALI MCGRAW AND STEVE MCQUEEN"
In 2007, the four members of Grinderman released their self-titled debut album. On 13th September 2010, the Grinderman saga continues with the release of Grinderman 2, their all-new studio album on Mute. The first thing that hits you about Grinderman 2 is that you've never heard anything like it. Ever. The debut album did its job. It defined the band. It marked a clear contrast with Nick Cave & The Bad Seeds. Nick, Warren, Martyn & Jim forged a distinctly different way of working together. They cast off musical baggage, shrugged off accepted wisdom, and tested pre-conceptions about who they were as musicians. In the process, they took to the Bad Seeds hallowed legacy with a baseball bat. "HERE COME THE WOLFMAN! THE ABOMINABLE SNOWMAN!" Their new album, Grinderman 2 combines the structured invention of their live performance and the unrestrained free-for-all of their studio improvisation. But these guys also know something about the art of writing songs. Grinderman 2 bears the hallmark of its rapturously received predecessor, yet is more open-ended in its structure, more far-reaching in its scope, and gloriously lost in its own transports of noise and rhythm. "TRY NOT TO WAKE THE EXECUTIONER"
2009 was an exceptionally busy year for all the individual members of Grinderman and Grinderman 2 became a very on-and-off-again affair that extended over the course of several months. Despite outside delays, whenever Grinderman did manage to assemble in the studio, they worked at their now legendary full-tilt pace. Their interpersonal chemistry and work ethic is exemplary. They enjoy playing together, and simply roll up their sleeves and go about it in a vigorous no-nonsense manner. The initial process of recording, improvising, and trying anything once, was the same as on the first album. Over twenty hours of raw spontaneous music were logged in the inaugural five-day songwriting period. 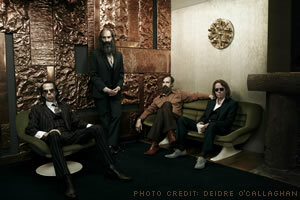 Grinderman filtered the results, refining them through demos, and fleshing them out as songs. The upshot of the procedure is this: if Nick is inspired to hang some lyrics on a groove, or a set of chords, or even just a fleeting flurry of sounds, no matter how rough or open-ended, then the song has a future and can move forward. Finally, after all the preparatory phases were done, recording and mixing sessions proper commenced. Grinderman co-producer Nick Launay, a man of infinite patience and enthusiasm, was brought in. The resulting opus, Grinderman 2 is a restlessly ambitious creation. "JUST HOW LONG YOU GONNA BE MY BABY?" A work of sublime sonic adventurousness, the songs on Grinderman 2 are awash in an atmosphere of surreal unrelenting malevolence. Grinderman 2 is a concept album in search of a concept. A panoply of figures divine and profane shuffle through the lyrics. Creatures of mythic legend and mundane celebrity enact terrible and perverse dramas within a metaphysical, blood-soaked battlefield. A brief dreamy overture - then the album bursts open with a ferocious bang and howl. The first track "Mickey Mouse & the Goodbye Man" picks up the gauntlet Grinderman's previous album so audaciously threw down. This snarling rocker unfolds at a remorseless pace the grotesque tale of a pair of parasitical brothers. Who is the lovable one? Who the loathsome? Which one the ultimate evil? Who cares? Here the origins of terrorism - isolation and envy - are laid tragically open. "CRYING LIKE A DEMON IN YOUR DADDY'S ARMS"
Muhammad teaches, "Women are the twin halves of men." Well, yes, indeed! And it is this inscrutable "other" that the next three songs, "Worm Tamer", "Heathen Child" and "When My Baby Comes" orbit. Nobody does women like Cave and there ain't nothing like "Worm Tamer" - a mayhem of outlandish noises borne over maniacal bass and turbo-drums; "Heathen Child" cuts a deep seductive groove with squalls of sawtooth distortion. Both songs abound in lyrical imagery at turns lascivious, paranoid, philosophic, absurd and flat out abusive. "When My Baby Comes" completes the feminine triptych, a kind of unearthly samba, that implodes upon climax into a super-heavy mushroom cloud of loops and f**k-me bass. "It is a man's own mind, not his enemy or foe, that lures him to evil," teaches Buddha. Well, yeah, and after a brief interlude of free-falling introspection ("What I Know") we are thrown directly into the blistering mayhem of "Evil" - easily Grinderman's most malignant musical challenge to date and that's saying something! Prepare to be eviscerated, people! Dual panegyrics of desire and devotion follow - the mind-blowing "Kitchenette" and the space-surfing psycho-pop of "Palaces of Montezuma" - each seductively and subversively groovy in its own right. But just as it appears as if love might prevail after all - don't panic! - in ride four horsemen of the Funkadelic apocalypse with "Bellringer Blues", a dazzling soulful tromp and a stone cold masterpiece. "OK JOE IT'S TIME TO GO!"